Critical Periods of Development and Growth Rates. Growing foals develop at a very fast rate and have very specific nutritional requirements. They develop the fastest in utero and then in the first year. 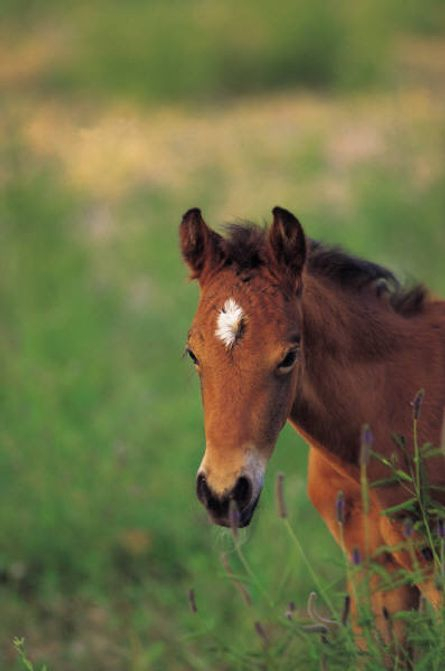 During this year and in the womb foals go through many critical periods of development. There is a common belief that ‘underdoing’ a weanling or putting it on poor pasture or restricted diet, protects it from OCD and other abnormalities. While this certainly slows the growth, it also puts foals at risk of mineral deficencies and missing critical periods of development, if they are not optimumly supplemented. Excessive growth or over feeding has been linked to OCD lesions but interestingly research has identified that it is not the rate of growth increasing that puts the youngster at risk, but that developmental issues arise when the mineral content of the diet does not match the rate of growth. Of course a heavy overweight foal is dangerous for other reasons. It puts undue stress on bodies and systems which are not structurally strong yet. You only have to see the catastrophic effect of foal unsoundness to understand how fragile their bodies are. The general concensus is that normal weight and growth weights and optimum mineral supplementation gives the foal the best chance at optimum development and reaching their full genetic potential. While there is a myriad of choices to feed your developing weanling and young stock, combining energy with mineral and nutrient content has very definite drawbacks. Some weanings require more feeding than others and different caloric requirements is common amoung all horses. The minerals young horses need to grow correctly and avoid abnormalities are much more similar. Feeding different amounts of a premix puts young horses at risk of not receiving optimum mineral supplementation, because they are receiving a lot of energy from pasture and other sources. If you supplement their mineral requirements, you can vary the energy portion of the feed without risking changing the minerals fed. Getting it perfectly right is hard. You don’t want your horse to miss out and risk being permanently disadvantaged. For example, the gastric system develops at 4 times the rate of other more basic tissues in utero and if nutrients are missed at critical times, the resulting adult horse can become permanently more prone to problems. When supplementing horses, it is never a good idea to supplement only 1 or 2 minerals. All minerals have relationships with their neighbours and the absorbtion of one can be effected by the excess or deficieny of another. In this manner, supplementing by guess work and with only 1 or 2 minerals can be actually worse than not at all. Some minerals have toxicity levels and so care is needed not to over feed them so it is always best to feed minerals that are considered organic from a chemistry perspective, not organic as a layman term. This means the minerals are more stable and easily absorbed, excreted and much less toxic than inorganics. It enables horse owners to supplement with confidence knowing that toxicity is not an issue, if they feed too much it is easily excreted and if all the major minerals are supplied then there will be no holes in the nutrition. It is also very important to look after the calcium:phosphorus ratio of the feeds given, and there are also benefits to controlling protein levels in excess of 20% and introducing omega fats to the diet and limiting grain, however, it is mineral status alone which determines the correctness of development and the expression of genes. Teeth and bones are made of minerals… so it makes sense that these suffer if this not correct.